Cameras are almost inherently fragile. We’re talking about a couple microchips paired with a lens. There’s about ten thousand places for something to go wrong, and that’s before you shove them inside hazardous environments. But an explosion proof camera is made to overcome these types of difficulties. The name is misleading. Explosion proof cameras don’t necessarily have to be used in explosive environments, but they are built to survive a blast. Which can be useful in any number of workplaces containing propane, hydrogen, methane, or another type of flammable gas or dust. That might include chemical operating plants, sewage treatment, coal mines, and so forth. Additionally, these cameras were made to prevent the ignition of gasses and dust in their environment. In hazard zones, one spark can cause serious problems. Similarly, some environments require cameras to endure heavy corrosion, or to resist chemical reactions to make them suitable for submerging into fluids. But finding the right camera is actually quite simple, provided you know precisely what your intended use case happens to be. Do you need corrosion resistance? Are you dunking the camera inside a fluid tank? Depending on the kind of environment you’re using you may need higher levels of waterproofing. 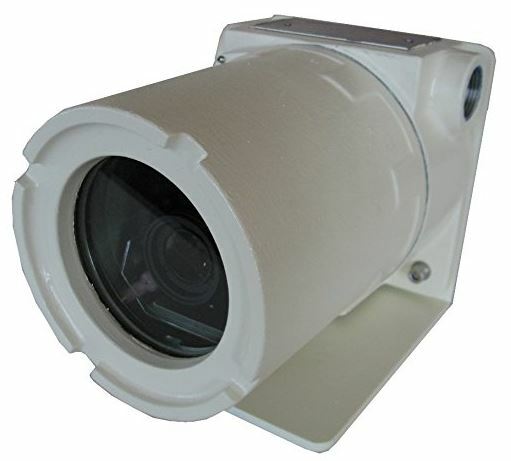 Due to the durable nature of this equipment, you’ll typically find that virtually all explosion proof cameras are partially or fully water resistant. Their level of resistance is typically related to their durability. Explosion proof means different things, to different people, at different times. That’s why you need to know about the kind of force which the camera may be subjected to. Some cameras are built sturdier than others. Only the best equipment is typically rated or certified. Class I Division 1 equipment is about as sturdy as you can make a camera without getting the military involved. If you’re not working around something like explosive ordinance, it’s unlikely you’re going to need specific certifications. It doesn’t matter if it’s an explosion proof camera or a security camera, vision in the dark is a pretty critical feature for most of these types of use cases. Anytime you’re using the camera in an area with limited natural light, you’ll want to think about the kind of night vision support the camera can offer. In most cases, it will be IR technology with a maximum range of about 30-feet. Occasionally, that IR is expanded out towards 100ft or more. For people who anticipate their shots will mostly be dark, there are superior alternatives to IR out there, but IR tends to be the most common choice. Unless you’re shooting at extremely high frame rates, or you’re shooting in UHD, camera technology isn’t something you’ll have to think about too much. For most people in most circumstances, a standard 1080p camera provides all the detail you need for practical viewing purposes. Even 20 years from now, it seems likely that most security camera footage, dash cam footage, and similar types of recording will still use 1080p resolution. Still, you’ll want to think about the viewing angle of the camera and its support for various frame rates. A wider viewing angle is typically preferable for this type of camera, especially if you don’t know precisely where to point the device. Frame rates aren’t as critical for most use cases, but it’s always nice to have options. The Hazardous Area Explosion Proof Video Camera is built around a 1080p camera. It provides a true 2-megapixel image with the help of a Hisilicon H.264 video chip, and does so with a level of protection that makes it suitable for operation almost anywhere. Moreover, the camera’s array of high efficiency LEDs is specialized for night vision performance, which makes this camera equal parts powerful and versatile. The Hazardous Area Explosion Proof Video Camera is about 8” in length, with a diameter of 5-inches. It’s easy to tell the construction is primarily composed of stainless steel. It’s even easier to tell when you pick it up because the metallic construction has left this camera weighing about 8lbs. Because the body is composed of stainless steel, it might seem a little redundant to say this, but this camera is also resistant to corrosion. The enclosure provides an IP68 waterproof protection, one of the sturdiest waterproofing protections you’ll find without getting a submarine involved. You get a sense of what that means by looking at the security glass covering the lens, it’s about 0.4″ thick. You might use glass of that thickness to keep a gorilla contained. In addition to its already lengthy list of protections, this camera is also bullet proof. The bottom side of the camera has two neatly placed installation holes, which allow for several different installation options. Using them, the camera can be made for an electronic pan/tilt base, or it can be semi-fixed. You can even use a mounting bracket instead. Behind all that armor, you’ll find a 1/2.7” CMOS censor with a 6mm lens. It allows you to record in full 1080p HD in the first stream, your second stream will be 352p, while the third is 176p. The maximum infrared viewing distance is about 160 feet, but you’re really stretching the IR at that point. For the motion detection feature, you can rig up as many as four separate regions among various cameras. The alarm link can be set to trigger email messages sent through FTP. Those messages can be accompanied by a snapshot from the camera. Pretty nifty. The frame rate can be moved between 25fps and 30fps, and you end up saving quite a bit of space if you can use the lower setting. Video compression is achieved with recording capabilities between 32Kbit/s and 6Mbit/s. Whether you’re trying to record enormous amounts of raw data, or you’re trying to save space, you’ve got options. With respect to power, you actually have several different options at your disposal. There’s a 12V DC or 48V POE connection you can use. It can also be connected with a standard 12V 2A power supply, or a 48V POE power supply. Whatever happens to be convenient for you. You also have user management options. You can dictate who is the administrator, and then create accounts for users and guests, each having their own unique access rules. 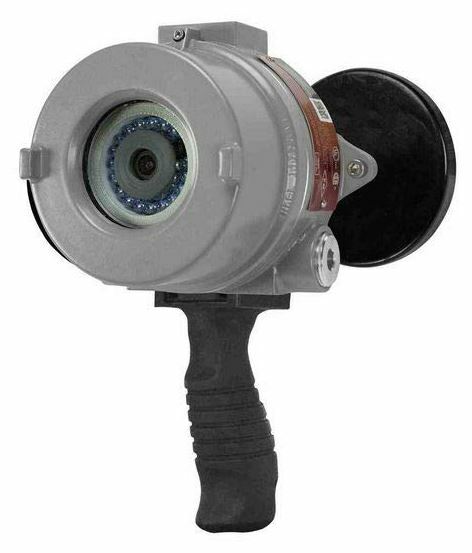 The Hazardous Area Explosion Proof Video Camera includes the camera, a bracket, and a user CD. You do not receive the power supply with the camera. You’ll need to power the camera with an RJ45 Ethernet cable or 12V power supply. The Hazardous Area Class I Division 1 PTZ Explosion Proof Camera is a combination of raw power and utility. Like you might expect, it uses an automatic full color HD camera. But what you may not expect is all the protection involved in defending that camera. This equipment is about as sturdy as things get. It’s rated class I, division 1, for groups B through D. It wouldn’t survive a nuclear blast. Though with enough distance, it would have a fighting chance. That certainly doesn’t describe many cameras. To the careless and uninformed observer, this device doesn’t look much like a camera. It measures 10.3 x 14 x 15.7-inches, and weighs pretty close to fifty pounds. The camera is housed inside an impressive 316L stainless steel enclosure. 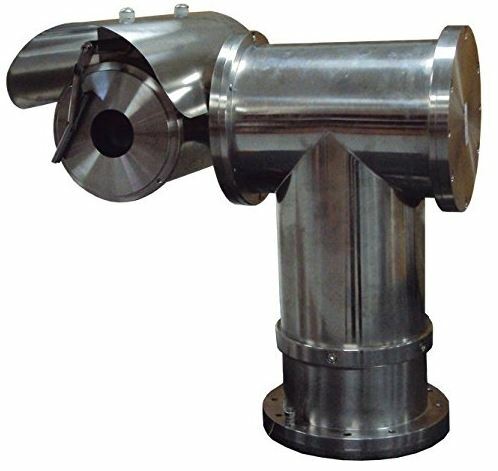 The 316L stainless steel enclosure uses an automatic heater/defogger and a blower. Because it’s stainless steel, you get all the various advantages of that material, including corrosion resistance. The armor is really best described by its certifications, while the camera deserves more attention. The camera inside this equipment is built to facilitate a 30x optical zoom. Note, that isn’t a digital zoom. You have pretty significant control over your shots, especially because the camera is built around a precision pan and tilt mechanism. Without even requiring motion from the metallic casing, you can squeeze some motion from the lens. When this equipment is almost inevitably exposed to explosions, the camera equipment is ready to accommodate rapid and drastic variations in illumination. It can automatically swap over to black and white footage when necessary, a method which also serves to help address IR filtration problems. For shooting in low light conditions, that can lead to much greater clarity. The camera needs an IP connection for power, using standard 100-240VAC 50/60 Hz current. But really, the configuration and setup of this equipment is really no more complicated than cameras which cost a fraction of this price. Larson’s camera was made specifically as a remote inspection camera for hazardous areas. The explosion proof design is also resistant to less extreme forms of damage. It’s tamper resistant, protected from the weather, and protected from dust. Which makes it useful for the inside of reactors, tanks, and similar hazardous spots. The camera was constructed with a layer of copper-free alloy protecting it. Because it’s covered in a shell of protection, it weighs about seven pounds. Pretty hefty for such a relatively small camera. Nevertheless, Larson’s camera is shockingly handheld. It’s scarcely 8” tall, and about half of that height is the handle. Once you’ve got it wired up, the camera allows an operator to view the feed through a live stream. The Larson viewing app isn’t exactly going to blow you away, but it lets you access a live view of the camera, which is basically all one could ask. If you want to do much more than that, you’ll have to get your own third party software involved. The camera is built around a 1/3” CMOS capable of 4-megapixels when running 20fps. Though it doesn’t sound like much, broadcast television runs at about 24 frames per second. It’s actually pretty smooth, though 20fps does put some soft limitations on the kind of detail you’ll be able to get from rapid motion. Larson’s camera uses a wide angle lens, which provides an 83-degree field of view. That’s similar the kind of field of view you would expect from a security camera. It’s a long, wide shot, which is ideal for circumstances where you’re not precisely sure where to aim the camera. A narrower field of view is more suitable for shots where you know exactly where to position things, though the 83-degree angle isn’t so wide that it cannot be used in that manner. When its environment is too dark to record using visible light, the camera will automatically shift over to IR mode. The IR LED array provides visibility in poor lighting conditions, and it provides vision in the dark. At least, for about 45-feet. Connecting with the camera is possible through a standard RJ45 Ethernet cable. Unfortunately, no Ethernet cable is included with this camera. Larson’s Explosion Proof Network IP camera includes a pair of rear-mounted magnets, which can be used to mount the camera to flat magnetic surfaces, or be used for better grip during handheld operation. The Hazardous Area Explosion Proof Video Camera is surprisingly impressive. Even though this is more of a value-oriented choice, it really helps you cover all your bases. It’s made from high strength stainless steel which is built to last, the LED array is built to last, and the camera doesn’t disappoint. Mounting it is easy. It’s particularly easy to imagine this camera being mounted on the outside of a ship, or similar aquatic environments, which is where it’s most suitable. The Hazardous Area Class I Division 1 PTZ Explosion Proof Camera is not something you’d want to strap to a ship. True to its name, this is a camera you’d want to use around hazard areas. Invulnerability isn’t cheap, but that’s really the only serious complaint worth levying against this camera. The Larson Explosion Proof Network IP Camera brings all of the versatility of the Hazardous Area Explosion Proof Video Camera, and then adds on further. There are more mounting options, and there’s considerably improved night vision. The waterproofing makes it ideal for setting up on offshore rigs, workboats, and similar aquatic circumstances. Additionally, the copper alloy makes it a good choice for people who are worried about chemical reactivity.